There’s something unassuming, perhaps slightly corporate, about Nuffield Southampton Theatres’ new city-centre arts space. Perched on top of a Nando’s, its beige panels and big glass windows looking washed out on a drizzly day, it would be easy to mistake the new building for an office block or luxury flats. Once inside, and up a wide flight of stairs, the space opens out into a huge bar and cafe. Staff members rush around and deliveries arrive endlessly as final preparations are made for the public opening. With a fully flexible 450-seat main house, a 133-seat, black-box studio, rehearsal space, offices, bar, cafe, restaurant and screening facilities, it’s the mutant twin of the original Nuffield Theatre building – so named because of a grant from the Nuffield Foundation. That was built by the University of Southampton in 1964 at a cost of £150,000. Today, it is a 500-seat, proscenium-arch space a couple of miles away that has been renamed NST Campus with the advent of the new space. 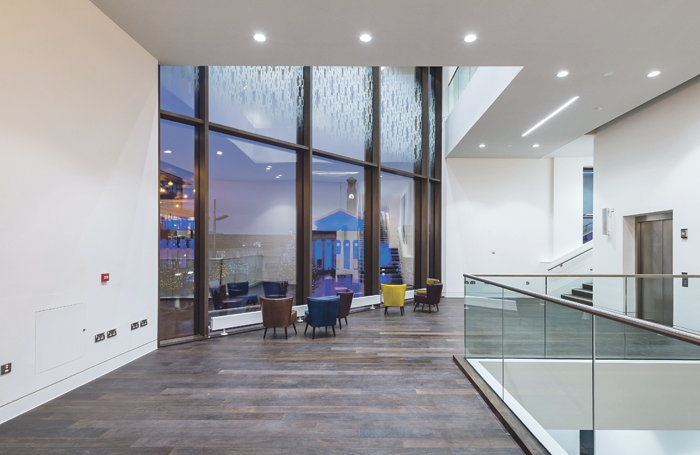 NST City, as the new venue is called, takes up half of the £30 million Studio 144 along with the John Hansard Art Gallery, and is the final element in Southampton’s ambitious cultural quarter, which has been 15 years in the making. There’s a sense of nervous anticipation, but bullish confidence too: with its first production, Howard Brenton’s The Shadow Factory, already breaking all sales records, the team knows it is on to something good. “It feels like a reboot,” says artistic director Sam Hodges in an office smelling of paint and new carpet. When he took over at NST in 2013, the project had been in the offing for a decade, with several companies vying to run the building if it was built. Although Nuffield had won a tender to run it in 2008, Arts Council England dramatically overturned the decision in 2009. Hodges admits it is “extraordinary” that the council has put so much money into the project when arts budgets are being slashed across the UK. “The impact of a building like this might make it more valuable than collecting the bins – but it’s difficult to have that argument directly with residents,” he says. Expanded facilities at NST City will now allow the organisation, in its first year, to produce six main house and two studio shows, with Hodges hoping that will increase to seven or eight in future. 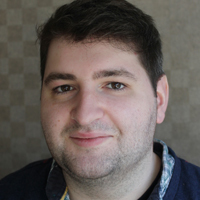 Since Hodges’ role was already a full-time job at the campus, the organisation has created a number of senior roles to work across both buildings. So now he is accompanied by executive director Caroline Routh, head of operations Hannah Maun and head of programming Katy Snelling. Snelling’s role is particularly important as the new building prepares to put on music, film, dance, spoken word and circus alongside its theatre programme. That flexibility is possible because the main house has an 8-metre cinema screen and projection facilities, allowing it to start broadcasting NT Live screenings later this year, as well as retractable bleacher seating that can create a completely flat floor for gigs. 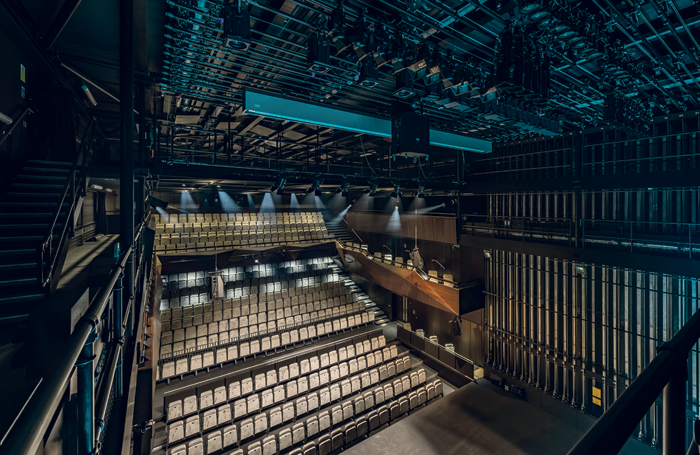 Alongside this permanent seating, NST worked with Plann to design a ‘kit of parts’ – “it’s essentially Young Vic-esque, modular seating”, says Hodges – that allows for in-the-round, traverse and thrust configurations within the performance space. Design consultancy Arup, which has been involved in the project since 2003, also designed the space so that its acoustics can sustain different art forms. Whether for a live gig, cinema screening or theatre show “performances come across really beautifully and clearly, and you can hear the detail”, says lead acoustic designer Don Oeters. Both of the main spaces have also been built ‘box-in-box’, which means they are physically isolated from the main building’s structure, a set-up that will prevent noise bleeding in from the bar and nearby shops. Designing the building from scratch has huge advantages: Arup has been able to embed things like outside broadcast cables into the fabric of the building. But Nuffield’s late arrival to the party meant that the building has not entirely been designed as a producing theatre and it was too late to change many elements. So, on the one hand, there’s the promise of plenty of loos, no restricted views (at least in the end-on configuration), accessibility via lifts and ramps, and good legroom. On the downside there is no scenery workshop, and a major quirk of the venue is that it is not on the ground floor. As Ian Butler from architecture firm Glenn Howells explains, moving scenery, materials and costumes from a get-in at street level was an “unusual challenge”, so there is a 5-tonne goods lift that leads straight up to the auditoriums. Butler also explains that spaces have been designed to be multi-use, so rehearsal spaces double as function or seminar rooms to ensure NST can bring in income from outside hires such as conferences and meetings. But ultimately the focus of this space and its diversity of art forms is to attract new audiences. “A key aim was to create a contemporary space that is attractive to young people that also appeals to other sections of the population, including families and people unaccustomed to visiting arts venues,” Butler says. 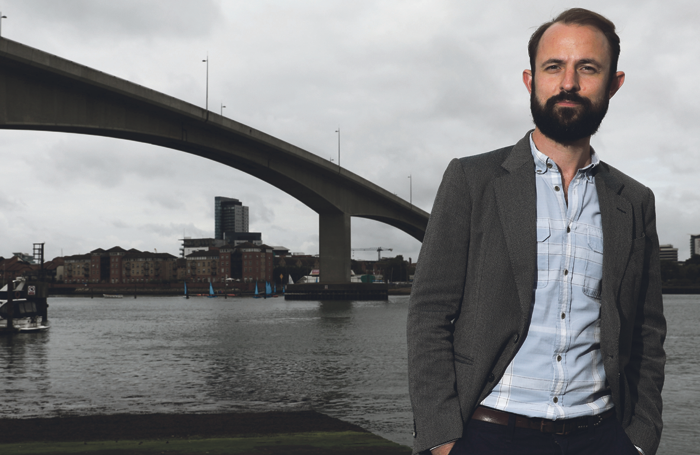 The world premiere of The Shadow Factory, which has involved creating a makeshift thrust stage with eight tonnes of concrete, tells the true story of how Southampton pulled together after its critically important Spitfire production factory was bombed in 1940. Hodges is keen to strike a balance between local and national, to give platforms to mid-career artists as well as draw in some star names, to support diversity and to celebrate exciting design. 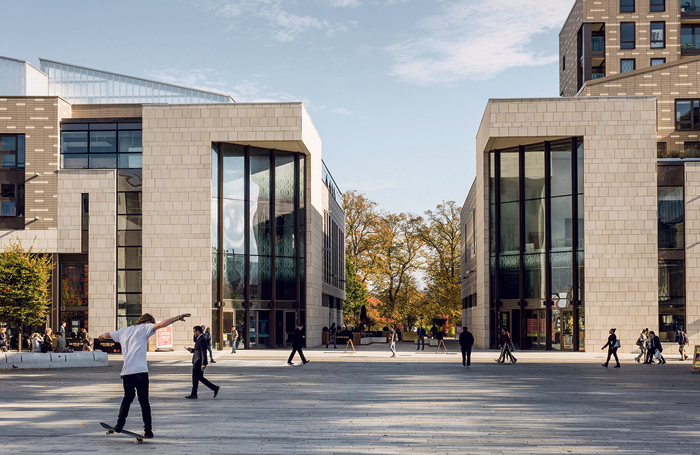 It was announced last week that both actor Harriet Walter and rapper Craig David had become patrons of Nuffield Southampton Theatres.